As brands strive for differentiation, relevance and growth, a clear purpose brought to life in compelling ways is often the difference between success and failure. In this article, I try to give a comprehensive introductory guide to what brand purpose is — and highlight some watch-outs along the way. The best definition I have heard is ‘a higher order reason for a brand to exist than just making a profit’. 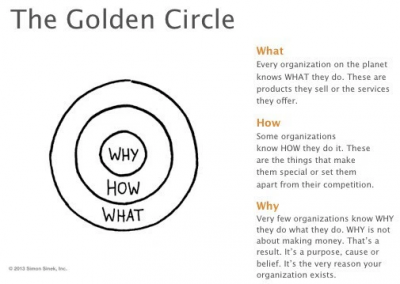 A good place to start is Simon Sinek’s work around the ‘why’ of a brand. Knowing the deeper ‘why’ your company or brand exists provides the foundation on which to build everything else — your ‘how’ (organizational culture, brand experience) and your ‘what’ (what products or services you offer). ‘How’ they did it was by creating a culture of technology, design and innovation fueled by a gigantic ambition to move the world away from polluting fossil fuels. ‘What’ they created to do it was a series of supercool electric vehicles as well as the entire infrastructure (a network of charging stations, a massive Gigafactory to make cost-efficient batteries) to support them. The people who work for Tesla are galvanized by the sheer ambition behind the brand purpose of the company, which invests their work with meaning. Similarly, the customers who buy Tesla vehicles are also drawn to the deeper ‘good’ that driving a supercool electric vehicle results in: zero emissions to combat climate change, and being on the cutting edge of a clean energy revolution. 2. What is the difference between ‘Purpose’, ‘Vision’ and ‘Mission’? One of the biggest problems when discussing this topic is that there doesn’t seem to be a commonly accepted set of terms to define ‘purpose’ and how a company then translates that purpose into action. For the purposes of this article, here’s what I have found to be the simplest framework through which to think about the topic. Vision is ‘Where’ of where you want to get to: This is a destination of what you want the brand or business to be in the future (e.g. ‘We want to be the world’s leading provider of X by 2020′). Values are the ‘How’ you would like to behave in order t o get there: What is the organizational culture of a company or an organization? And what are the qualities or behaviors it prizes: for instance, curiosity, inclusivity, diversity of thought etc. In other words, just like marketers had to learn to grapple with the massive implications of digital, we need to understand the profound implications of purpose which are equally transformative. 4. What are examples of some good brand Purposes? A succinct, well-articulated brand Purpose that everyone in the company knows and believes in is crucial. My favorite story to illustrate the power of purpose to inspire organizations is that of President John F. Kennedy who was walking around NASA in 1962 and saw a janitor carrying a broom. When he asked the man what he did, “Well, Mr. President,” the janitor responded, “I’m helping put a man on the moon.” It showed how the purpose of NASA had powerfully spread to every single person within the organization. Here are a few more to check out. 5. 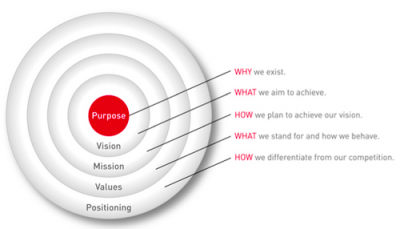 Why is Purpose important to drive business? Having a clear and compelling brand Purpose isn’t some hippy-dippy, cosmic ideal. Here are some of the data that points to how purpose-driven companies and brands outperform their competitors on multiple levels. Jim Stengel, the former CMO of Procter and Gamble in his book ‘Grow’ showed the results of a 10 year study of 50,000 brands and found that the ones that centered around improving people’s lives beat their category competitors by significant margins. An investment in them would have been 400 percent more profitable than an investment in the S&P 500. Unilever CMO Keith Weed has also publicly stated that the highest-performing brands in their portfolio (growing at twice the speed of the others) are purpose-driven brands. In fact, he has gone so far as to say that ‘sustainability isn’t a moral issue for Unilever, its an economic issue.’ Paul Polman, Unilever’s visionary CEO has also spoken at length about the need for purpose in business. Here’s a great link with a collation of many different data sets that show the power of purpose in driving performance. 6. Purpose is also now crucial in attracting the best talent to your organization. Survey after survey shows that people want to work for a company where their contributions will not only be valued — but also work for companies that have a deeper reason for being than only profit. 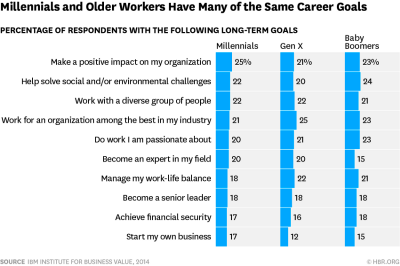 For instance, this Deloitte survey showed that “Millennials would prioritize the sense of purpose around people rather than growth or profit maximization.” This Gallup survey shows that Millennials “look for work that fuels their sense of purpose and makes them feel important.” And in case you think that this doesn’t apply to other generations like Boomers and Gen X then this Harvard Business Review article begs to differ. So in order to future-proof themselves for the next generations of talent, brands need to find a meaningfulness in what they do. And if you don’t believe the surveys, just ask yourself this question: do you think you would find more meaningfulness in the work you did for a living if you knew that it had a positive impact on society? 7. 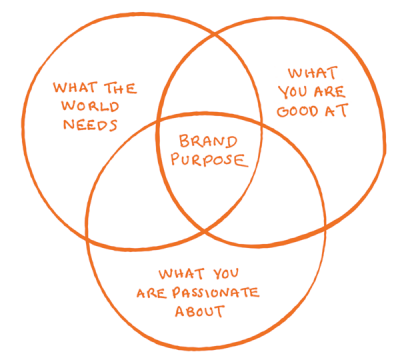 What are the main types of Brand Purpose? 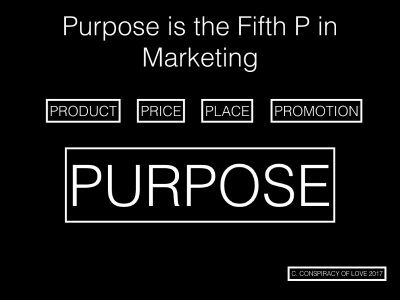 Ex-P&G CMO Jim Stengel, in his book ‘Grow’, divided these high-performing brands into five main categories of purpose, which I find to be a useful way to think about it. Eliciting Joy e.g. Coca-Cola … exists to inspire moments of happiness. Enabling Connection e.g. FedEx … exists to bring peace of mind to e veryday connections. Inspiring Exploration e.g. Airbnb … exists to empower creative exploration and open new experiences. Evoking Pride e.g. Mercedes-Benz … exists to epitomize a lifetime of achievement. Impacting Society e.g. Dove … exists to celebrate every woman’s unique beauty. To further illustrate this idea, mobile phone and telecom brands could be around ‘connecting the world and each other’ (remember Nokia’s ‘Connecting People’) while travel brands in the airline and hotel industries could be about ‘exploring new horizons’ (think AirBNB’s ‘travel like a local’).other’ (remember Nokia’s ‘Connecting People’) while travel brands in the airline and hotel industries could be about ‘exploring new horizons’ (think AirBNB’s ‘travel like a local’). 8. What are some of the misconceptions about Brand Purpose? One major misconception is that Purpose is that it is solely about social good initiatives, or sustainability, or CSR, or cause marketing. All of these things can be outputs of a good Brand Purpose but they are by no means the only possible ones. A great purpose should manifest itself in everything a brand does: from product development, to customer experience, to how it should conduct its marketing. Another misconception is that Purpose cannot change with time. 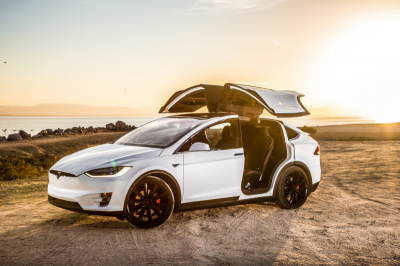 Remember Tesla’s original brand purpose — ‘to accelerate the world’s transition to sustainable transport’? Here is how it was updated with one added tweak. Notice what changed? They’ve replaced the word ‘transport’ with ‘energy’. This signals Tesla’s much bigger shift from an automotive-focused company to wanting to provide your entire clean-energy ecosystem. Witness their announcements around the Tesla Powerwall (a home battery pack) or their amazing Solar Roof. Not content with taking on the major car manufacturers of the world, Tesla is also taking on all the energy companies as well. Remember: One purpose. Many missions. 9. How do you discover Purpose? Creating new brands with purpose at their heart is easy. But what if you’re a decades-old brand that has well-established attributes — but no clear brand purpose at it’s heart? a. An ‘archaeological dig’ : A deep-dive into the history and heritage of the brand, the story of the founders, it’s reason for coming into existence in the first place. “To make cleanliness commonplace; to lessen work for women; to foster health and contribute to personal attractiveness, that life may be more enjoyable and rewarding for the people who use our products”. b. A brand evaluation: Looking at a brand’s strengths (what you are good at) and passions (brand passion points), and their intersection with how the brand can be of service to the world. I like this chart from Brand Language Design. For instance: Red Bull’s purpose is ‘to revitalize mind and body’ (expressed in the form of their tagline ‘Red Bull Gives You Wings’. They are passionate about the world of action sports, and they have became really good at creating brand experiences and content that were of service to that community. The result? A company that allegedly makes more money from that content and experiences than the drink — and which has the courage to stage revolutionary marketing experiences like the Red Bull Stratos jumpwhich brings that purpose to life. c. Ask your employees: Finding out the stories of why they are proud to work for your company or brand often unearths the real value that they see in the work that they do. Even if you have hundreds of thousands of employees scattered around the world, the technology exists in the form of platforms like VisionLab which allow you to collate feedback extremely quickly. d. Ask your customers: Similarly, asking your customers (and associated stakeholders like retailers, suppliers and other partners) can help unearth valuable insights as to the distinctive, own-able higher-order purpose for your business. By integrating these sources of research and data, a brand can uncover a compelling brand purpose which can help it future-proof itself for generations to come. 10. How do you bring Purpose to life? Walmart is a great example of a brand that brings its purpose to life in clear and meaningful ways. Every employee understands the role of the company in helping its communities get access to the best possible products at the lowest prices. Here are it’s brand guidelines which bring it to life. Thinking of the ‘product as a service’ is another great way for a brand to manifest its purpose in a way that adds value to the lives of their customers. Under Armour is another favorite example of mine. The company’s purpose is to ‘Empower Athletes Everywhere’. In using technology to create ‘Connected Fitness’ experiences like their UA Healthbox box, they are evolving from being merely an apparel company to becoming your personal health and fitness guru. Think about this: In a world where all your data is recorded and mapped on an Under Armour system which constantly optimizes your fitness and health, how likely are you to switch to another brand? By creating physical or digital experiences that are at the intersection of ‘useful and delightful’, a brand can add value to people’s lives and gain a degree of loyalty that no TV ad can ever achieve. Taking money out of advertising (which people continue to universally detest) and investing it in things which improve cities is another great approach. Another favorite example is Citibank, whose purpose is ‘Enabling growth and progress.’ They made a $41 million investment over six years in sponsoring the Citibike bike sharing scheme in New York City. The result? Massive ROI on brand reach and relevancy (the bike stations are on almost every corner, and people are constantly tweeting and instagramming pictures of them), brand advocacy and consideration (double digit jumps, according to Citi’s internal research) and the chance to become that rarest of things: a verb. When you ask a New Yorker how they got somewhere, they’ll say ‘I Citi-biked it.’ How awesome is that? Lest you think that this approach only works in developed markets, here’s another favorite example of mine from the paint brand Dulux, whose purpose is to ‘add color to people’s lives’. They believe that color means emotion: optimism, positivity, inspiration. They backed that up with the Let’s Colour project which gives neighborhoods around the world free paint to brighten up schools, carparks, and other community areas. The result? Over 1200 projects around the world in Asia, South America and Europe- and a positive impression of the brand more lasting than any short-term piece of billboard ever could. 11. How can companies find out what positive social impact they should focus on? This is a problem that many brands have: when faced with the dizzying areas of problems a brand could work on solving, how does it chose what is best for them? Well, for one thing, they could ask their community of employees and customers: today with the direct communication brands can have via social media and CRM, why not ask them what they want? A brand is a co-creation between the people inside the brand and outside the brand : that dialogue should drive important decisions like this. My co-author on ‘Good is the New Cool: Market Like You Give a Damn’ (a book on purpose-driven brands and marketing), Bobby Jones and I, often discuss how we would love to see a brave brand use a platform like Change.org to ask its customer base to nominate issues close to their heart. One of the most exciting new platforms I have seen in recent years isGoodpin, which enables a brand to empower its customers to decide where it’s social good contributions should go to- and then reward them with offers that can help drive sales in-store — a perfect way to clearly show the ROI generated by social good initiatives, not just in brand metrics, but sales as well. Another misconception is that brands should only get involved in solving the massive pro blems of the world — social justice, climate change, inequality. Not true. As we said in ‘Good is the New Cool’, brands have the opportunity to solve problems from the ‘everyday to the epic’. As the UnderArmor and Citibike examples show, there are plenty of ‘everyday’ pain points that a brand can invest its resources and energy in resolving. 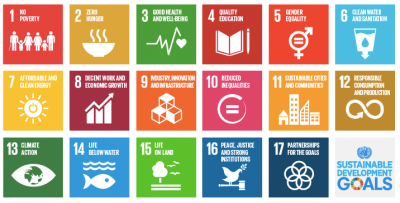 What particular SDG a brand aligns with would depend on the brands purpose, and how closely it aligned with its business and social goals. Imagine if McDonald’s aligned its purpose around Goal №2: Zero-hunger, transforming itself into an organization that delivered the most nutritious food at the lowest prices, in the most sustainable way? How powerful of a rallying cry would that be for its 1.7 million employees and its 68 million daily customers. In conclusion, I believe that we are moving to a new paradigm, where purpose-driven brands will be in the best position to attract the right talent, drive their brand and business, and do a tremendous amount of good in the world. I believe that this purpose-driven approach works in every single category in every single country around the world. 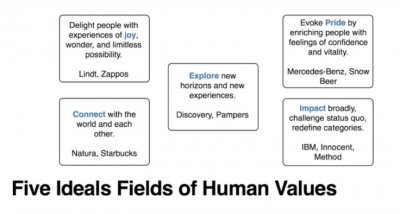 I believe that marketers who embrace this paradigm will find a deeper level of meaningfulness in their work and see the potential to genuinely add value to the lives of their customers. I hope this article helps in some small way to accelerate that change.